Family Violence Charges Geelong – The client was charged with stalking under s 21A(1) of the Crimes Act 1958, numerous charges of using a carriage service in a manner a reasonable person would regard as harassing under s 474.17(1) of the Commonwealth Criminal Code Act 1995, numerous breaches of his bail conditions under s 30A(1) of the Bail Act 1977, two charges of unlawful assault under s 23 of the Summary Offences Act 1966, and entering private property under s 9(1)(e) of the Summary Offences Act 1966. The client had a verbal dispute with his partner, which prompted her neighbour to contact the police. Under pressure from her roommate, the client’s partner made a statement declaring she felt for her own and her children’s safety around the client. As a result of this statement, a Family Violence Intervention Order was placed on our client, protecting his partner and her children from being reached via any kind of communication. The client was released on bail with the same conditions under the Family Violence Intervention Order. Following this, our client continued to communicate with his partner for a period of four days, until she returned to the police station and provided them with a statement of no complaint against him, retracting her statement expressing fear for her own or her children’s safety. Unfortunately, it was revealed to police that the client had continued to communicate with the complainant in contravention of the order imposed by the magistrate. Our client was then interviewed by police, where he made admissions to breaching his bail conditions via communications with his partner for the previous four-day period. The allegations were serious, and had significant ramifications for the client, who ran his own company and was concerned about further convictions due to the nature of his employment. Through negotiations with the Police Prosecutors, we were able to show that the client and his partner were in an ongoing, healthy and stable relationship. This was indicated by the partner’s own statement to Victoria Police as well as her application to vary the Family Violence Intervention Order to allow their relationship to continue and grow. It was also of assistance to the matter that the client’s partner was also communicating via telephone and text messages. She responded to messages and frequently called the client. We also sought plea materials, and the client was able to source a number of character references that all spoke to his gentle, respectful nature. He also provided letters from a number of ex-partners who spoke highly of him. Additionally, the clients’ prior offences were both dated, and irrelevant to the circumstances of the charges. It was beneficial for the Court and the Prosecution to see that it had been almost two decades since the client’s prior offending, and that the charges were out of character. We further indicated in negotiations with the Prosecution that the dispute was not seen by the person who reported it, and that the roommates of the client’s partner were not reliable witnesses to the Police. 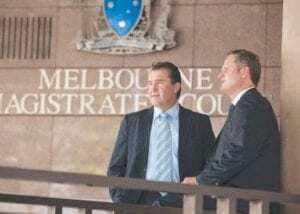 This essentially meant that the Prosecution had to take the client and his partner at their statements given to Victoria Police. This was a benefit to our case as our client had been honest in all of his interviews with Victoria Police, making full and frank admissions to certain charges, and his partner had made a statement withdrawing her prior complaint. Through negotiations, we also pointed out to the Prosecution that one of the assault charges was said to have been communicated via text messages but there was no evidence supporting the charge. Further reading through the hundreds of messages, there was not one message that was threatening or menacing. From the Summary Case Conference stage, the Prosecution withdrew all charges except for one charge of using a carriage service in a manner a reasonable person would find harassing and one charge of breach of bail. After submissions on the client’s character, employment, lack of history and ongoing relationship, the magistrate handed down a $500.00 fine with a conviction. This satisfied the client’s needs, as the charges involving violence had been withdrawn.